This is not only a shop. This is a place where you can make yourselves more special and attractive in your won ways. I like to make jewelarys for the lady who love to invent herself everyday and gift her a new look. as I am a lady, I also like to ware ornaments which can present myself as I am. My handmade jewelarys are made by myself. 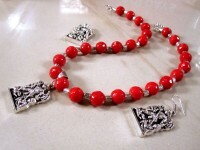 the basic materials used here are German Silver, oxidized metal, Beads and Threads. Those are ideal for today's lifestyle . You can carry it in any occasion. I like to make designer jewellery  with oxidized metal and German silver . I have a small jewellery boutique Named Laila's Creations. Products are shipped through reputed courier services only. Please do not accept the shipment if it appears damaged or tampered with on arrival. If the product is broken or has any manufacturing defects it can be refund within 5 days after handed over to the buyer.